Cuba's President Raul Castro, makes a keynote address at the opening of the Seventh Congress of Cuba's Communist Party (PCC), at the Convention Palace of Havana, capital of Cuba, on April 16, 2016. 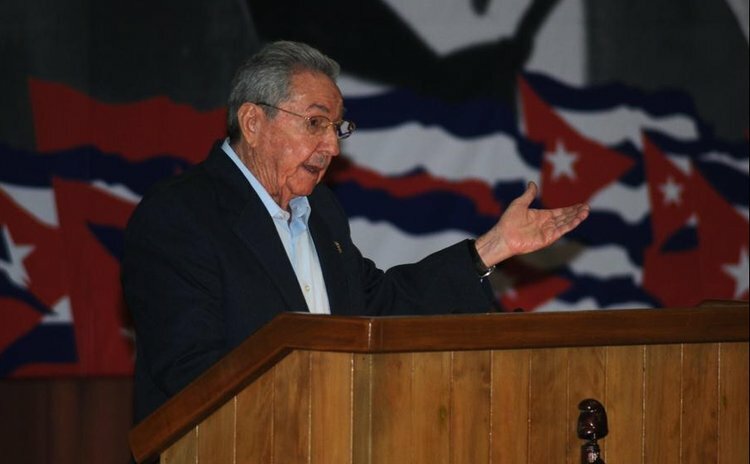 HAVANA, April 16 (Xinhua) -- Cuban President Raul Castro on Saturday called for political and constitutional reforms to the island's socialist system and warned of the U.S. "real intentions" in mending ties with the Caribbean nation. During a keynote address at the opening of the Seventh Congress of Cuba's Communist Party (PCC), Castro said the Constitution should be amended to reflect "the new era" of modernization, and to set term limits on political leaders. "The next five years will be decisive for our country and we propose a systematic policy to renovate all government and party officials," the first secretary of the party said. He also proposed an age limit to enter the party's Central Committee and its top decision-making bodies. The renovation of the leadership, said the president, will take place over the next five years leading up to the party' s next congress in 2021, though Castro himself will be stepping down earlier. "It is no secret that my second term as president of the councils of State and Ministers will come to an end in 2018, and I will hand over my responsibilities to whoever is elected," Castro said. Regarding the recent rapprochement between Cuba and the U.S. following half a century of enmity, Castro said all Cubans should know Washington's intention toward the government in Havana remain the same -- regime change -- but the White House is today taking a different tack. "We must be more vigilant than ever, since the U.S. has changed its strategy, but not its objective," said Castro, warning "the methods used will be more difficult to counteract." Nonetheless, both countries continue to work to normalize ties and the Cuban government is committed to fully developing "beneficial cooperation" for both sides, said Castro. "We must work on what unites us and build new bridges of cooperation for mutual interests," he said. Castro called on the PCC and political organizations to foster greater participation of the people in the decision-making process, "since only frank, honest discussion among revolutionaries can produce solutions."